a home in town and continued contracting and building for ten years, retiring from active life in 1904, and he and his venerable wife are passing their declining years in comfort, with their children all doing well in life. Mr. Alexander was married at Montello, Wisconsin, October 26, 1855, to Miss Ann McWilliams, a native of Belfast, Ireland, born September 12, 1818, a danghter of William and Mary (Kearnes) McWilliams, who came to America and settled in Wisconsin. To Mr. and Mrs. Alexander eleven children were born, ten of whom survive: Margaret, wife of Mr. Christian Lerum, a sketch of whom appears in this work; Jane, married David Miller, and makes her home with her aged parents, of whom she takes the tenderest care; Roderick, farming four miles south of Plainview; Sarah, now Mrs. Albert Borden, lives in Washington; Robert, has a ranch near Bloomfield, Nebraska; William lives on a farm three miles south of Plainview; John, a stock dealer of Plainview; Mary, deceased was the wife of Gus Kemnitz; Rachel, married Sam Johnson, a baker of Plainview; Alice, is the wife of William Dutcher, who is farming a mile west of Plainview; and Gilbert, the youngest, has remained with his father, and was his mainstay while on the farm. Mr. and Mrs. Alexander were reared in the Presbyterian faith. In politics, Mr. Alexander is republican. The family endured many of the hardships or pioneer days. Besides the pest of grasshoppers and the alarms of prairie fires, blizzards, caused them much suffering and many times Mr. Alexander has slept out in winter storms with little shelter but a blanket stretched over poles; at times he has weathered a three days' storm in this way. Their fuel was secured along Verdigris creek, and the trip out and back with a load of wood usually consumed two or three days. On one of these trips Mr. Alexander and his companions round themselves reduced to the last match, and this a wet one. Mr. Alexander took it, put it within his clothes until the beat of his body had dried it somewhat, and then finally succeeded in striking a light and making a fire to warm them through the night and cook their food. Mr. Alexander has had a long and useful life of many vicissitudes, but is now in peace and plenty surrounded by his family and friends in the evening of his well spent life. George Kilpatrick, for many years a prominent citizen of Howard county, now deceased, was an early settler in that region and became one of the successful and leading men of his locality. Mr. Kilpatrick was born in Scotland, June 9, 1826, and grew to manhood in that country, coming to America in 1847, his first location being in Michigan. He was married at Woodland, that state, on May 13, 1854, to Phoebe Wilson, and they spent the following twenty-five years in different states. Mr. Kilpatrick came into Howard county in 1879, landing here in October, and immediately afterwards purchased six hundred acres of land. Of this original homestead five hundred acres are still owned by the family. They went through all the pioneer experiences met by the early settlers in the region, and succeeded in building up a splendid farm and comfortable home, Mr. Kilpatrick finally becoming one of the foremost men of his section in local and county affairs. He was an ordained minister in the United Brethren church, serving as such while living in Michigan, for about ten years, and after locating in Nebraska connected himself with the church here and continued his work along those lines. He traveled on the circuit for many years prior to his demise, visiting in turn Cedar Creek, Cotesfield, Peck District, Woodriver, Alda and Dannebrog, which is known as the Grand Island Circuit. In his death, which occurred on August 26, 1881, the entire community suffered a deep loss, as he was an earnest christian of splendid character. Robert, born in Berry county, Michigan, March 3, 1855. He has spent his entire career as a farmer, has been successful and gained the esteem and respect of all by his integrity and straightforward character. He has been married twice, his second marriage occurring in Cotesfield, on June 24, 1904, when he was wedded to Minnie Evans. They have two children: Isabelle, and Phoepe Melvina. Mr. and Mrs. Kilpatrick have a pleasant home and are among the leaders in educational and social affairs in their community. ognized, as one of the prominent pioneers, is a worthy representative of an honorable family, and has an enviable reputation as an individual of fine character and integrity. Mr. Kilpatrick was married to Maud Ethel Seymour in York, Nebraska, in 1899, at the home of her parents, who are well known old settlers in that vicinity. They have one daughter, Dorothy, now a charming young girl. Abraham Lincoln Kilpatrick, the third son, was also born in Woodland, Michigan, May 16, 1865, and accompanied the balance of his family to Howard county in 1879. He has made this vicinity his home since that time, living at home until he was twenty-one years of age. Several years after the death of his father, the estate was divided among the heirs, Abraham receiving his share of one hundred and twenty acres, which lies on section twelve, township sixteen, range twelve. He has made of this a highly improved farm,. having splendid buildings of all kinds, is known equally well with his brothers as a prominent man of the section, and is now successful and prosperous. A. L. Kilpatrick was married on January 18, 1889, to Addie Josephine Newhall, who was reared in Howard county. Mrs. Kilpatrick died in 1897. They had two children, Frank and Harry, the former now deceased, while the latter still lives at home. July 27, 1900, Mr. Kilpatrick was married the second time, to Margaret May Smith, also of Howard county, and she died the following year, leaving one child, Henry, who makes his home with his grandparents in Wheeler county, Nebraska. Mr. Kilpatrick was married again in 1903, to Mary Francis Kafka, in Howard county, and of this union three children resulted, Joseph, now deceased, Francis and Leslie, bright youngsters whose presence makes the home a pleasant one. Mr. Kilpatrick has always taken an active interest in local and county affairs. He has served as director of the school board in district number forty-eight, for three years, and is also active in church work in his locality. He is a capable and clear-headed business man, and was appointed administrator of his father's estate. Stephen D. Kilpatrick, the youngest son of Mrs. Kilpatrick, was also born in Woodland, Michigan, April 2, 1868. On the division of his father's estate, Stephen received one hundred and twenty acres in section twelve of Cotesfield precinct. This place he operated up to 1911, in that year going with his family to St. Cloud, Florida, where be has purchased land and intends making his home for the future. December 24, 1895, Mr. Kilpatrick was married at St. Paul, to Miss Harriet E. Seymour, and they have two children, Eber and Ivan. Stephen D. Kilpatrick has been prominent in republican politics, and has filled various school and precinct offices here. He still owns eighty acres of the old homestead. David Wigent, an old-timer of Valley county, Nebraska, lives on his fine farm which is situated in section four, township nineteen, range thirteen. He was born on a farm in Berrien county, Michigan, August 17, 1859, and was first in a family of six children born to John and Rachel (Meck) Wigent, they having four sons and two daughters. Our subject received the usual school advantages in his native county, where he grew to his young manhood; and in December of 1877 the Wigent family came to Valley county, Nebraska, where the father homesteaded land. The father died in Valley county about 1889; and the mother survived him but three years, her death occurring in Jerico Springs, Missouri. Four of the children are living, two of whom, David and Charles, reside in Valley county; David lives on his farm in the northeast quarter of section four, township nineteen, range thirteen, and Charles lives in the southwest quarter of section four, township eighteen, range thirteen; Henry Wigent lives in Jerico Springs Missouri, where the mother died in 1892; Marrilla Wigent, now married to R. J. Bronson, also resides in Missouri, near Lockwood. David Wigent, the principal subject of this sketch, took up a homestead in Valley county in 1880, twelve miles northwest of Ord, living on this homestead about eight years. In 1892 Mr. Wigent went to Missouri and lived there until 1901, returning to Valley county in the fall of that year, purchasing his present farm home on section four, township nineteen, range thirteen, which is now a fine farm, well equipped in every way. Mr. Wigent is one of the original homesteaders who has always had strong faith in old Valley county. Mr. Wignet was united in marriage to Miss Agnes Pacas in Valley county, Nebraska, April 22, 1884. Miss Pacas is a native of Moravia, Germany, but comes of an old Valley county family. Mr. and Mrs. Wigent have four children, namely: William, Minnie, Frank, and Bessie. They have many friends by whom they are surrounded in their pleasant home. Mr. Wigent has in various ways assisted in building up Valley county. He is a self-made man, and has made a success by his own energy and thrift and many sterling qualities. He is inpendent [sic] in politics. Mr. Wigent lived in a sod house on the original homestead and for three years on his present place before a modern frame dwelling was built. Deer and antelope had not been driven further toward the mountains when Mr. Wigent came, and he has seen them running wild since settling in Valley county. Prominent among Madison county's old settlers is William Filsinger, who since the fall of the year 1884 has made this region his home, and in every manner possible aided in the development and progress of the agricultural resources of this section of the country. He resides in section eight, township twenty-one, range three, where he has built up a valuable estate by strict attention to his duties, thrift and perseverance, and also occupies a foremost place in the history of that part of Nebraska. Mr. Filsinger is a native of Baden, Germany, and was reared on a farm. He was born November 18, 1872, his birthplace being near the Rhine river, and was the oldest child in the family of Christ and Barbara Filsinger, the former serving in the French and German war in 1870 and having a creditable record as a soldier, of which his son is very proud. The entire family left the old country for America, taking passage on an emigrant ship at Hamburg and landing in New York after an eventful voyage. They immediately struck out for the western states, and landed in Madison county, Nebraska, in 1884. Our subject at this time was twelve years of age, and he begun working out on farms in the vicinity of his home, continuing up to 1896, at which time his father purchased the farm where he now lives. This has been improved with substantial buildings of all kinds, and is in a high state of cultivation at the present time, well stocked with cattle, horses, etc., and is one of the best grain producing properties in the region. May 31, 1899, Mr. Filsinger was united in marriage to Miss Emma Nutsman, and to them have been born the following children: William, junior, Christ, Henry, Ellen, and Alma, all sturdy young people and growing up to be of immense help to their parents. Mr. Filsinger is active in local affairs, and with his family take a lively interest in neighborhood matters appertaining to the schools and social doings. Nathan A. Smith, who owns a section of land in Custer county, is one of the best known and most popular citizens of his region and has held various township and county offices. He was born in Effingham county, Illinois, March 24, 1860, next to the youngest child of John and Mary (Devore) Smith, who had three sons and a daughter. He was reared on his father's farm and lived in his native place until August, 1883, when he came to Custer county, reaching Grand Island by train and making the rest of the journey with a horse. He secured a homestead on the northeast quarter of section twenty-nine, township eighteen, range nineteen, and in the fall of the same year returned to Illinois. On January 10, 1884, Mr. Smith was married to Nancy A. Blackwell, daughter of Thomas and Martha Blackwell, who was born in Kentucky. A brother and two sisters of Mrs. Smith at one time resided in Nebraska. Her brother now lives in Oregon; one sister, Mrs. Frank Wooters, lives in Custer county, and the other sister, Mrs. Henry Metzger, lives in Madison county. In May, 1884, Mr. and Mrs. Smith came to their Custer county homestead, where they have since continued to reside, with the exception of four years (1894-97, inclusive) they spent in Broken Bow. He passed through the adverse years of the early part of his residence on the farm and became a successful pioneer farmer, one of the few to retain possession of their original homesteads. He was the only member of his immediate family to come to Nebraska, and has a father and two brothers in Illinois. He has been actively interested in the welfare and development of his county and state and is recognized as a citizen of public spirit. He served as a member of the county board of supervisors in 1892-1893, and was deputy register of deeds for the county from 1894 to 1898, and has been prominent in township affairs, having served as township treasurer and as a member of the school board, besides other local offices. Mr. Smith and his wife have four children, all born on the homestead: Thomas, married and living in Custer county; Mary, wife of Sylvester Smith, of Custer county, has one child; Lacy and Tony are at home. Mr. Smith is a member of the Modern Woodmen of America. Nels E. Erickson is one of the leading farmers of his part of Wayne county, and is a representative farmer of his locality. He is well known, and, while not one of the oldest settlers, has many friends. Most of the improvements on his farm have been the result of his own efforts. Mr. Erickson has always performed his part in promoting the general welfare, and has won a high standing as an upright and reliable citizen. He is a native of Sweden, born March 25, 1854, a son of Eric and Anna Samuelson, who were farmers, and spent their entire lives in Sweden. Mr. Erickson was educated in his native country, and was reared to agricultural pursuits. greatly enhances the value and beauty of his estate, and has erected various buildings, which were needed for caring for his grain, stock and tools. He uses improved machinery, and is much interested in modern methods and ideas. He carries on general farming, and pays especial attention to the raising of various kinds of stock. In 1887, Mr. Erickson was united in marriage to Miss Selina Magnuson, who was born in Sweden, a daughter of Peter J. and Tilda Magnuson, natives of Sweden, who came to the United States in 1886. Four children have been born to Mr. and Mrs. Erickson, of whom three now survive, namely: Anna Matilda, Ruth Leniea and Raymond. Delia died in childhood. Mr. Erickson and his wife have many friends throughout the county, where both are well known. They are members of the Methodist Episcopal church. One of the highest tributes to be paid to a citizen is to say that he is a leading old settler, and the gentleman named here is certainly entitled to this honor, richly deserving a foremost place in the list, having lived in Merrick county, Nebraska, since 1871. 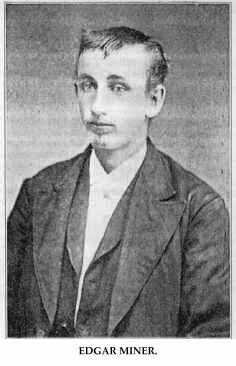 Noah Heater was born in Pike county, Pennsylvania, in 1837, and was fourth child in the family of Anthony and Mary (Hoover) Heater, who had six children, four sons and two daughters. Our subject was raised on a farm, receiving the ordinary advantages of those days. In 1858 he left Pike county, going to Bureau county, Illinois, where he engaged in farming. In the fall of 1862, Mr. Heater was joined in wedlock to Miss Sarah L. Huffaker, and three children were born of this union: Annie, who is married, has seven children, and lives in Kansas City, Missouri; Israel, who is married, has two children, and lives in Illinois; and Mary, who is married, and living in the Panama zone district, has three children. Mrs. Heater died in 1866 in the state of Illinois. On July 11, 1868, Mr. Heater was married to Mrs. Eva Kieser, and in May, 1871, Mr. and Mrs. Heater and their one, child, and also the three children of Mr. Heater, came to Merrick county, Nebraska, taking up a homestead about three miles northwest of Clarks, and here they lived until June, 1903, when Mr. and Mrs. Heater moved to the town of Clarks, where they had purchased a comfortable home. Mr. Heater and his second wife have five children: Lottie, who is married to Mr. Charles Cosner, lives in Clarks, Nebraska, and has one child; Alta, who is married to Mr. Dell Brown, has one child, and lives in Idaho; and Sophia, who is married, has one child, and also lives in Idaho; and Lily and Robert, deceased. Mrs. Heater died at her home in Clarks, January 3, 1910, and Mr. Heater continues to reside in Clarks. Mr. Heater was one of the first settlers of this portion of Nebraska, and has passed through the different phases of pioneer life. He is a quiet man, not so active in political or public life as some have aspired to be, but always doing his share toward the advancement of his home county and state. John Andersen was one of a worthy family that came from the province of Schleswig, in the northwest part of the German empire, in 1880. They settled in Benton county, Iowa, and followed various lines of employment there until coming to Holt county in 1881. Here John Andersen farmed, about seven miles north of Atkinson, but two dry years, in which all his crops were spoiled, drove him back to western Iowa, where he was employed at farm labor during the year 1888. He then returned to Holt county, Nebraska, where he followed farming for the next three years, and then filed on a homestead claim in Boyd county, seven miles southwest from Naper, on which he resided ten years. He opened a saloon in Naper, and was in business here until 1909, when he sold his place, and opened a shoe store, to which he has added a stock of dry goods. He is also buyer for a creamery at Lincoln. Mr. Andersen was born in the village of Huesby, near the city of Schleswig, in the province of that name, in the German empire, August 18, 1864. He is a son of Andreas and Margarita (Will) Andersen, who, with their family, including our subject, came to America in 1880. Andreas Andersen had been a soldier in the oId country, serving as a lieutenant in the revolution of 1848 to 1852, and participating in twenty-eight engagements without receiving a wound. The family sailed from Hamburg to Hull, spent three days in London, and then proceeded to Liverpool, expecting to ship from there, but the steamers were loaded to their capacity. Returning to London, they embarked, and, after twelve days at sea, landed in New York, whence they migrated to Luzerne, Benton county, Iowa, where they resided until coming to Nebraska, as before stated. Mr. Andersen was married in Holt county in July, 1889, to Miss Cecelia Jansen, a native of Benton county, Iowa, a daughter of John Jansen. Eight children were born to Mr. and Mrs. Andersen, named as follows: Etta, wife of Henry Smith, who is farming east of Naper; August, now clerking, and has finished two terms in the Grand Island Business College; and Herman, a graduate of the ninth grade in the Naper schools, class of 1910, and who is associated with his father in the store. Five younger children are: Alfred, Otto, Edwin, Vena and Vere. Mr. Andersen has witnessed many of the severe storms that have swept the west: The blizzard of January 12, 1888; the cyclone of 1900, when a brother's two children and a neighboring family were killed; and severe hailstorms, such as are unknown in the east. During the early days, when fuel was scarce, they burned hay, corn, stalks and "chips" that are found scattered over the prairies. Mr. Andersen is a republican in politics. He was reared in the Lutheran church, and contributed to the building of two churches, one in Naper, and one, one and one-half miles west. He is a member of the Sons of Herman lodge, and the Independent Order of Odd Fellows and Encampment. He is a popular, substantial citizen, and is highly esteemed and respected by all who know him. Jacob Louis was for many years, prior to his death, a leading farmer and prosperous citizen of Platte county, Nebraska. His family still reside in this locality, and are well and favorably known throughout the community. Jacob Louis was born in Germany, September 2, 1834, and in 1852 emigrated to Ohio, and in the spring of 1856 he came to Omaha, Nebraska, where he formed the friendship of several other young Germans, and also became acquainted with a young man by the name of Rausch, who lived in Omaha; and in March, 1856, Fred Gottschalk, Adam Denck, Mike Smith, Rausch and our subject walked from Omaha, and came into the Platte valley, and founded the town of Columbus. Mr. Louis purchased one hundred and sixty acres of land, and this farm still remains in the Louis family, and lies adjoining the corporation limits of Columbus, on the east. Mr. Louis, after a residence in the Platte valley for four or five years, returned to Ohio, and on April 2, 1865, was married to Miss Katherine Engel, in Middletown, Ohio, and soon after, Mr. and Mrs. Louis came to Nebraska, taking up their home on the farm, which Mr. Louis had purchased in 1856. Mr. Louis was a sturdy pioneer settler, of quiet, industrious habits, and this original farm remained his home place until his death. Mr. Louis was a well-known pioneer settler, always giving of his time and means to the upbuilding of his home town and county. He passed through the pioneer days of Platte valley, and was a successful farmer, and held the esteem and respect of all who knew him. Mr. Louis died at the home place, October 6, 1909, in his seventy-fifth year, survived by his wife and four children. Mrs. Louis continues to live on the farm, and with her lives her two sons, Charles Carl and Jacob Louis, eldest and youngest of the children. George Louis was married to Miss Isis Tripp, and lives on one of the Louis farms, four miles east of Columbus; they have five children: Ruth, George, Katherine, Edward and Carl. Katherine Louis, the only living daughter, is married to William Stevenson, and they live on their farm, near the George Louis place; they have two daughters, Dorothy and Katherine Elsie. All the Louis children were born on the old farm, and the family are one of the few old pioneer families still residing on the "home place." Mrs. Louis is still active in the management of her home, and is a delightful woman to meet, having a vivid remembrance of people and early settlers' life, and now, in the closing years of her life, enjoys a review of the old days. She has had a busy life, and is widely known. Her sons, Carl and Jacob, who live with her on the old farm, are men of sterling character, and are industrious, good citizens. Too much credit cannot be given the old pioneer family, they having passed through the hard times of the earlier period when they feared the Indians, suffered drouths and many other hardships, and are now enjoying success and prosperity. George Robinson, an early settler of Antelope county, Nebraska, is one of the most highly respected and esteemed citizens of his community. He has a pleasant and comfortable home and valuable estate in Sherman precinct, and has gained his entire prosperity through industrious effort and honest dealings, supplemented by thrift and good management. Mr. Robinson has been an important factor in the evolution of Antelope county, Nebraska, and now resides in section fourteen, township twenty-eight, range eight, where he and his family are loved and respected by all who know them, and their friends are many. Mr. Robinson was born in Jackson county, Iowa, November 11, 1863, and when a young man, went to South Dakota, where he was employed by Missouri Southern railroad, where he remained four years, and from thence went to Adams county, Iowa, staying there one year. In 1883, Mr. Robinson came to Antelope county, Nebraska, where he took up a homestead in section twenty-four, township twenty-eight, range eight, on which he built a dugout, living in that one year and a half, when he built a frame house, and later he took as a tree claim the northwest quarter of section twenty-four, township twentyeight, range eight. In 1895, our subject sold all of his property, and moved to Berry county, Missouri, living there four years, when, in 1899, he returned to Antelope county, Nebraska, and bought his present farm, which, as before stated, is located in section fourteen, township twenty-eight, range eight. ber 20, 1885, to Miss Irma Sherman, and Mr. and Mrs. Robinson are the parents of eight children, named as follows: Jessie; Roy, who is married to Miss Ella Harvey; Harry; Charles; Victor deceased in 1894; George; William, and Edith. They are a fine family, and are highly respected and well thought of in their community, and have a host of warm friends and neighbors. Mr. Robinson's father, William Robinson, was a native of West Virginia, and his parents came from Scotland. Our subject's mother, Armina (Scherman) Robinson, was born in 1843, in Pennsylvania. Mr. Robinson's father came to Nebraska in 1864, and was in the government freighting service, and hauled supplies to all the government forts between Omaha, Denver, and Butte, Montana. Mr. Robinson is a well-known stock raiser, and he enjoys a wide acquaintance all through this section of the state, and is highly respected by all with whom he has to do. Although comparatively a young man, James Edwin Hurlburt is one of the earlier settlers of Custer county, and he is a citizen who is representative of the best interests of his community he belongs to a family that has passed through the early pioneer days of Nebraska, and he has a fine stock and grain farm in Custer county, which he operates with gratifying success. Mr. Hurthurt was born in McDonough county, Illinois, August 4, 1870, son of Allinson P. and Eunice (Robinson) Hurlburt, who were natives of Philadelphia and Ohio, respectively, he born in 1839 and she in 1832. They were married in Illinois about 1867, and had three children born in that state, James E. being one of a pair of twins. In 1875, the family moved to a farm near Nevinville, Adams county, Iowa, and in the early spring of 1883, they came by team to Blaine county, Nebraska, camping for three weeks along the way. Here they spent several years on a homestead, but in 1890, they removed to Custer county. The father died on his farm in February, 1903, and the mother died there, October 14, 1906, They were survived by their two sons, Samuel D. and James E. The former is married, and lives in Sherman county. Mr. Hurlburt was educated in the country schools, and reared on a farm, and he took up a homestead in the east half of the northwest quarter of section thirteen, township seventeen, range eighteen, in the fall of 1891, this later being the home of his parents. He was married at Broken Bow, Custer county, November 28, 1892, to Miss Minnie M., daughter of David and Matilda (Casteel) Hutchens, who came from Cass county, Illinois, to Seward county, Nebraska, in 1880. The Hutches family spent one year in Seward and one year in Hamilton county before coming to Custer county, where they secured a homestead. The parents and the four surviving children now live in the state. Mrs. Hurlburt was one of seven children, but she and her sister, Mrs. Irving Sherbeck, are the only ones who live in Custer county. Three of the children are now deceased, two brothers, James and Eliphalet, live in McPherson county. Six children have been born to Mr. Hurlburt and wife, as follows: Goldie, Ruby, Julia, Esther, Fannie and Edwin, all at home. Both Mr. Hurlburt and his wife are of pioneer stock, and are widely and favorably known in the county. They have a well-developed and equipped farm, and a comfortable farm home. In national elections he is republican, but locally is independent of party lines. Mr. Hurlburt has had some experience as a hunter of big game, having killed eight deer in Blaine county. He has suffered from the drouth of 1894, and on the sixteenth of July, 1893, hail ruined his entire crop. But the hardships of the early days are but a memory, which success and prosperity are fast relegating to oblivion. Edgar Miner is one of the upright and reliable citizens of Custer county, who have won success in life after a hard struggle with the hardships and difficulties of pioneer existence. He is a man of retiring disposition, but well known for his willingness to aid the cause of progress and development along lines beneficial to the community. He is well known among the early settlers, many of whom he helped locate when he came to the county, and is one of the few who have always retained possession of their original homesteads. He was born in the state of New York, October 14, 1847, fifth child of Simeon and Almira (Larrabee) Miner, who had three sons and seven daughters. Both parents were natives of New York, where they were married. a distance of eighty miles. Mrs. Miner died on the homestead, February 26, 1884. On June 12, 1886, at Ord, Nebraska, Mr. Miner was united in marriage with Miss Annie Palmer, daughter of Frank Palmer. Her mother and step-father, Mr. and Mrs. L. Miner, came to Custer county in 1881. Mr. and Mrs. Miner continued to make their home on the old farm until coming to their pleasant residence in Comstock in the spring of 1909. They have always done their part along all lines progress, and owe their success in life to their own works. For a number of years he was director of school board number six, and held various township offices. He and his wife have five children: Clarence, married, and living on the home farm; Mabel, wife of R. L. Douse, living on a Custer county homestead, has two children; Leslie, Chester and Elizabeth. All were born on the homestead farm, and educated in local schools. A portrait of Mr. Miner will be found on another page of this volume. The gentleman whose name heads, this personal history, now deceased, during his lifetine, held at high position among the leading citizens of Valley county, Nebraska. He was engaged in agriculture many years in that section of the country, made a good success at the work, and, while building up at good home and ranch for his family, also aided in large measure in the development and growth of his locality. James B. Miller, decased [sic], son of Dudley and Aminta (Wood) Miller, was born in Ontario county, New York, August 7, 1831. He was seventh in a family of eight children, all of whom are deceased, as are also the parents, the father passing away on February 14, and the mother on February 17, of 1844, their deaths occurring near Laporte, Indiana. In 1839, the family had moved to Indiana, where Mr. Miller grew to manhood, when, in 1854, he was united in marriage to Mrs. Kate Sullivan, a native of Ireland. She died in 1871, survived by her husband and seven children: Frances, wife of Ed. Bressley, they having five children, and reside in Valley county; Emily, who is married to William Schoenemann, and lives in Indiana; Addie, wife of Benjamin Bridgford, has one child, and lives in Colorado; Dudley, who is married, and lives in Burwell, Nebraska, and has five children; Mira, wife of William Meridith, lives in Manitoba; Charles, now deceased; and Elmina, who is married to John Wittsche, and lives in Burwell, Nebraska. In 1872, Mr. Miller was married to Amanda Williams, of Laporte county, Indiana, and of this union one son was born, Silas, who is married, has two children, and resides in Michigan. On February 20, 1879, in Laporte, Indiana, Mr. Miller was united in marriage to Charlotte Ames, of that county. She is a daughter of Charles and Cynthia (Truell) Ames, natives of Massachusetts and New Hampshire, respectively. The father is descended from Perigine, the first child of European parentage born in America. He was a soldier in the war of 1812, and a second cousin of William Cullen Bryant, who boarded at his home for a time. In coming west in 1836, he made the entire journey by water, small schooners being the only vessels in that time plying the lakes. On sound, river, canal and lakes, the journey extended over fifty days before it ended at Michigan City, Indiana, after a severe storm on Lake Michigan. In 1880, Mr. Miller came to Valley county, Nebraska, homesteading one hundred and sixty acres of land four miles north of Ord, where he lived for twenty-one years. In 1901, he moved to Ord, but in 1907, moved on a farm four miles north of Ord, which he had purchased some years before. Mr. Miller died, January 25, 1908, on his home farm, survived by Mrs. Miller and one child, Charles A., who is married, and has a son and daughter. He is living on the home place. Edith died in 1887. Mr. Miller was a progressive man of affairs, closely identified with the interests of his county and was widely and favorably known. Mrs. Miller is living on the home farm with her son, surrounded by a large circle of friends. Mr. Miller was a democrat until 1856, when he voted for Fremont, and continued to support condidates [sic] of the republican party until the latter years of his life, when he became independent of the party lash. He was a member of the Methodist church, and of the Independent Order of Odd Fellows. The first five years in Nebraska, the family lived in a sod house, but, better situated than most of the early settlers, their rooms were floored with lumber instead of the bare earth. On coming to their Nebraska home, they left the railroad at Grand Island, driving across the country from there. Mr. Miller drove in advance in a wagon, while Mrs. Miller followed with the children in a covered buggy, to which was tethered the cow. Condensed milk was carried for use of the baby on the long trip from New England on the train. One of Mrs. Miller's early experiences in the country may be of interest. Returning from a neithbor's, accompanied by her son and a young girl, the dog started up an animal unknown to them. While the dog held it at bay, Mrs. Miller hurried to the house for the axe and a spade, which she threw at the beast, killing it. She learned later that her game was a badger.